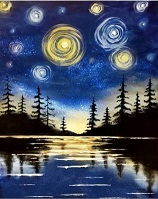 The Georgetown and Penn Alumni Clubs of Minnesota invite you to a private Paint Nite event at Barre Minneapolis. Cost: $40 includes the canvas, paint, use of all supplies, and instruction by the artist. What is Paint Nite? Paint Nite inspires people to connect creatively. We'll gather at the Barre Minneapolis (a block from Target Center) at 5:30PM; painting starts at 6PM. You'll hang out, meet people, order a drink and/or food if you want, but you'll do something else too. You'll get a blank canvas, bright paint, and a guiding artist who will instruct you how to paint the Minnesota-inspired "Starry Night" shown here. You can also borrow an apron to keep your clothes clean, or bring your own. The painting is yours to take home to hang, gift or continue to work on. We have a total of 40 seats available on a first come, first served basis, so please reserve your spot soon. Food/beverages can be purchased from the restaurant. No painting skills are necessary, so don't be shy and please come join us. RSVP/PAYMENT/QUESTIONS: Samantha Cook, Georgetown Club president, samantha.cook@gmail.com or 612-747-2592. Send check to Dan Rutman, Penn Club MN, 6728 Rosemary Lane, Edina MN 55439 Please make check payable to Dan Rutman and write "Paint Nite" in memo.